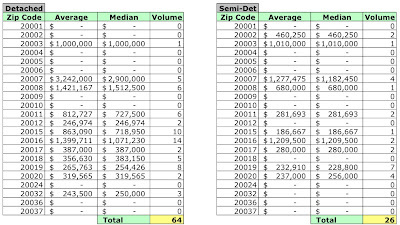 I've finished my analysis of full value residential sales the District recorded in December 2007. Same old, same old [second verse]. Sales volume in the District is down, condo prices are falling, single family home prices continue to appreciate despite falling sales volume. 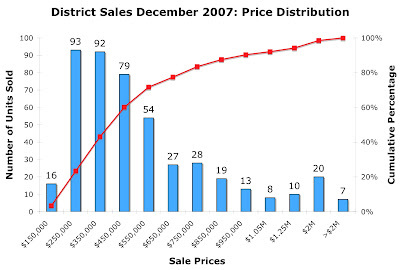 In December 2007 the District recorded 466 residential sales, 36.86% less than the same month in 2006. Dollar volume fell, too. Condo sales continue to dominate Wards 1 and 2. In Ward 1, 71.05% of sales were condos and in Ward 2, 81.91%. 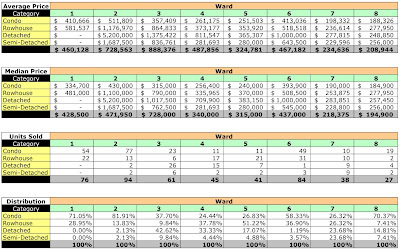 More than half of all sales in Ward 5 were rowhouses [51.22%] while detached homes dominated Ward 3 [42.62%]. The chart below shows the distribution of December's recorded sales by sales price. In the aggregate, average prices were up 12.38% while median prices were relatively flat, eking out a 1.14% increase. Sales volume continued its downward spiral, falling 36.86%; condos fell 41.07% and homes declined 30.94%. Overall demand for single family housing is down 30.94%. Average prices jumped 25.68% and median prices leapt 12.7%. All categories of houses had declining sales volume. 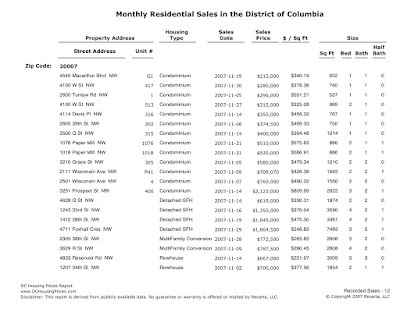 Once again, Ward 3 has the honor of having the highest average and median prices in the District. I continue to believe the high end homes are skewing the results. For example, one home in Georgetown sold for $7.5M and another in Wesley Heights sold for $3.775M; those two alone represent 7.75% of the dollar volume for single family home sales. 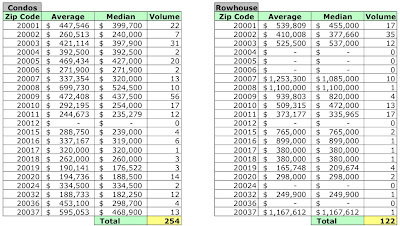 December 2007 average and median sales prices and unit volume by zip code. 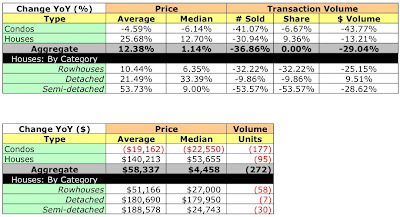 December 2007 average and median sales prices and unit volume by ward. Love the blog. I noticed you included The Flats at Union Row for the first time in you analysis. Any more info on those properties? I don't have any other info at this time.